Canned Enough Tomatoes? Now Make Some Lycopene-Rich Tomato Powder! Lycopene-rich tomato powder has many uses. I love to can diced tomatoes and tomato sauce. I also enjoy freezing them. But this weekend I thought I'd try dehydrating tomatoes and then grinding them into a powder. Besides the powder taking a lot less space than jars, dehydrating and powdering allows you to store the tomatoes in their raw state. Tomatoes are packed with the carotenoid lycopene. They also contain other healthy carotenoids such as lutein, zeaxanthin and beta-carotene. Tomatoes also are rich in other powerful phytonutrients such as flavonols, glycosides and others. Tomatoes have long been associated with heart health because they contain lots of antioxidants which reduce inflammation. They also can reduce total and LDL cholesterol as well as triglycerides. In addition to that, the phytonutrients in tomatoes can reduce the clumping together of blood platelets which often cause blockage. Besides being heart-healthy, tomatoes (and lycopene) have been recently connected to bone health. And the phytonutrient alpha-tomatine in tomatoes has been shown to lower the risk of prostate cancer in men too. Tomato powder is a good way to add these powerful phytonutrients to your favorite recipes. Here's how to make it! Start with fresh, ripe tomatoes that have been washed with the stem areas removed. You can remove the seeds if you'd like to get a finer powder but I just slice them as is. Slice the tomatoes and lay them out on dehydrator sheets. 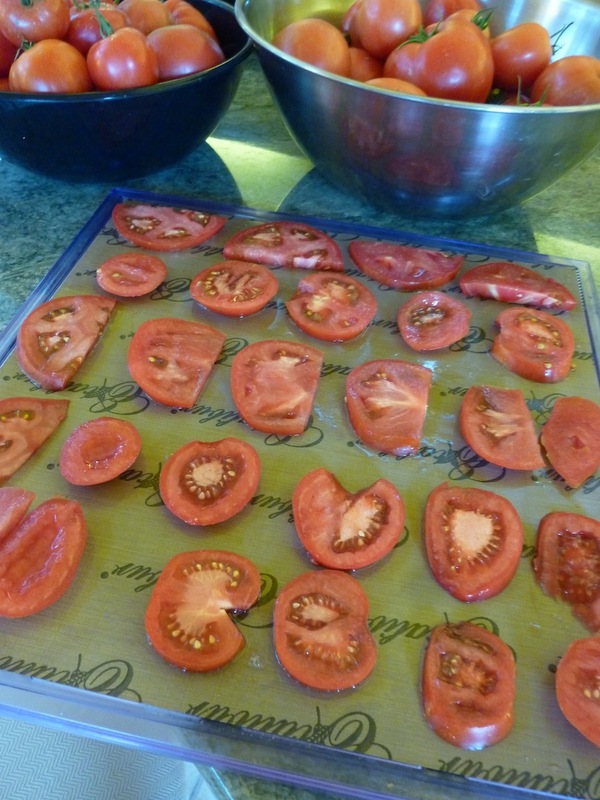 Lay the tomato slices on non-stick dehydrator sheets. Dehydrate at 115 degrees F. until dry, about 24 hours. Turn over and dehydrate on the mesh sheet until tomato slices are absolutely dry, about another 6 hours. This is what they look like after 24 hours of dehydrating. To make tomato powder, place the dehydrated slices in a high-speed blender such as a Vitamix or Blendtec. Blend until it becomes a smooth powder. Place in a small spice jar and refrigerate until needed. Place dehydrated slices in your blender. Blend until the slices turn into powder. Place in a small spice jar. How do you use tomato powder? Let us know! Blend 1 to 2 tablespoons of tomato powder into your favorite hummus recipe! How to live a long and productive life. The centenarians in this Italian city eat mostly a plant based diet consisting of fruits, garden vegetables, whole grain bread, beans, pecorino cheese made from grass-fed sheep, goats milk and a small amount of meat. They also enjoy a daily glass or two of a deep, red wine made from Cannonau grapes. The Sardinian shepherds walk about 5 miles a day. With respect to relationships, the family is extremely important to Sardinians. Grandparents have a key role which gives them a sense of purpose. Friends also play a key role and men are found laughing together in the streets each afternoon displaying their sense of humor which is very typical in Sardinia. These Japanese centenarians also eat a plant-centric diet with lots of stir-fried vegetables, tofu, sweet potatoes and bitter melon. They occasionally eat small amounts of pork. They typically have a vegetable garden as well as a medicinal garden containing herbs such as mugwort, ginger and turmeric. Besides the exercise Okinawans get from gardening, they also are avid walkers. Walking and gardening outdoors also exposes them to the sun which gives them a high concentration of vitamin D. Okinawans also sit on tatami mats on the floor rather than chairs and couches. The activity of getting up and down off of the floor many times a day contributes to the development of their lower body strength and balance. Friendships are key to these centenarians. They meet daily with their "moai", lifelong friends that provide their social network. They also have a keen sense of purpose and have a reason for waking up each morning. They live in the present and enjoy today's simple pleasures rather than dwell on past tragedies. Loma Linda is home to 9,000 Seventh-day Adventists, a faith that endorses healthy living. 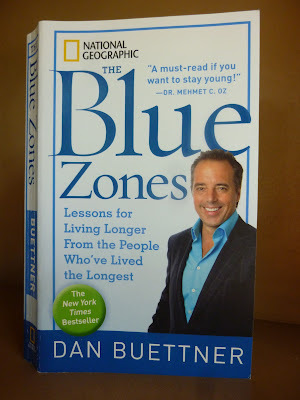 In fact, much detailed nutritional data about health and longevity has come from studying this group of people. Many Adventists are vegetarians although some eat meat in moderation. The Adventist centenarians tend to eat their biggest meals early in the day and a light meal for dinner. They enjoy lots of fruits, vegetables and nuts and drink lots of water. They exercise regularly but focus on moderate, not extreme, exercises. They maintain a healthy body mass index throughout their lives. Adventists tend to spend time with other Adventists who share their health goals - this makes it easier to maintain their good diet and exercise habits. It also gives them a strong sense of community. Their weekly 24-hour Sabbath allows Adventists to get away from daily routines and focus on family, friends, God and nature. The Adventist Church provides many opportunities for members to volunteer throughout their lifetime. This gives many of their centenarians a strong sense of purpose. The Nicoya's diet is centered around beans and corn tortillas, tropical fresh fruit like sweet lemons, oranges and bananas. They eat a very light dinner and drink lots of hard water, rich in calcium. That, together with lots of sunshine, gives them strong bones and fewer bone fractures. They get their exercise from everyday chores. These Centenarians live with their families and play an important role with their children and grand children. They have a strong sense of purpose and feel needed. The Nicoyan centenarians also maintain a strong social network and enjoy their friends and neighbors with whom they visit frequently. What can we learn from this? Can we take some lessons from these healthy centenarians and apply it to ourselves? What do they have in common? They all eat very natural diets and don't consume processed foods. All of them eat mostly plant-based diets, and those who eat meat do so in moderation. Actually, they eat most everything in moderation and maintain a consistent weight throughout their lives. But there are no magic foods and no big surprises in their diets. Ditto on exercise. They are all very active. No couch potatoes here. Many move in the natural course of living - herding sheep, walking to town, getting up from their tatami mats. Except for the folks in Loma Linda, most exercise is not done in the gym or on a treadmill. We have control of our diet and exercise and certainly have the ability to mimic these healthy lifestyles in these two areas. But what about the other characteristics like family, community and sense of purpose? I think the most enlightening trait that stands out to me is the strong sense of community among these centenarians. They are all part of a tight-knit community and have close friends whom they socialized with regularly. After all, they don't move around like many of us do. They live in the same town their entire lives. I can't name 3 people I went to high school with! They also live near or with their families and have a key role in the family structure. They all live purposeful lives and have a reason to wake up each day. This is a bit disturbing since so many people today live apart from their families. Parents rarely get to live with their children in their old age and have to resort to assisted living facilities where their diet is institutionalized and they lose their life purpose. The lesson to be learned here is if you are not near family, create one. Get involved in a community of like-minded people and create relationships and friendships. Most of all, find a purpose for your life - one that you can articulate. One you can be passionate about. Although there are some very interesting stories and lots of good information throughout this book, it is definitely not a page turner so you may only be able to read about 20 to 30 pages at a time before you get sleepy. 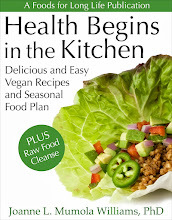 But it certainly will inspire you to eat better, get off the couch and think about your relationships and life purpose. Zucchini and onion crackers packed with omega-3. About this time each year I search for ways to use up my zucchini. This crispy cracker does the trick! Besides using 2 1/2 pounds of zucchini per batch, these delicious gluten-free crackers deliver 626 mg of omega-3 fatty acid per cracker! Here's how to make them. Grate the zucchini on a large grate. You should have about 7 1/2 cups of shredded zucchini. Grate the zucchini using the medium grates. Cut the onion in half or quarters and thinly slice. Slice the onion as thinly as possible. Place the zucchini and onions in a large bowl. If you are grinding your own flaxseeds, start with 1/2 cup of whole flaxseeds to yield the needed 3/4 cups of ground flaxseeds. Grind the walnuts in a Vitamix, food processor or coffee grinder (reserved for nuts and seeds). You will need 1/2 cup of walnut pieces to yield the needed 1/2 cup of ground walnuts. Add the ground flaxseeds and walnuts to the bowl of zucchini and onion. Add the soy sauce and lemon juice to the zucchini onion mixture. Mix thoroughly until well blended. Divide the mixture between two 14" x 14" inch non-stick dehydrator sheets. Spread it out into 11" x 11" squares. The mixture will look thick but it will thin out significantly after dehydrating. Spread mixture on to 2 dehydrator sheets. Dehydrate for 24 hours at 115 degrees F.
After dehydrating, the mixture will thin significantly. After 24 hours, flip over onto mesh dehydrator sheets. Slowly peel off the non-stick dehydrator sheets. Place back in the dehydrator for another 6 to 10 hours. Peel off the non-stick dehydrator sheets slowly. Place on a cutting board and cut into crackers with a pizza cutter or sharp knife. Cut one side into 4 equal pieces and the other side into 5 equal pieces. Each sheet will yield 20 crackers. Cut into desired cracker sizes. If the crackers are not crisp enough, place individual crackers on the mesh sheet and dehydrate until they reach the desired crispness. (If they still bend, they are not crisp enough). Serve with soup, along with dips, or just enjoy as is! Per cracker: 26.1 calories, 2 g fat, 0.2 g saturated fat, 625 mg omega-3 and 690 mg omega-6 fatty acids, 0 mg cholesterol, 1 g protein, 2 g carbohydrates, 1 g dietary fiber and 52.5 mg sodium. Garden Tomatoes Stuffed With Quinoa And Sweet Corn - Vegan And Gluten Free ! Baked tomatoes stuffed with quinoa and corn. Although many parts of the country have already been enjoying garden tomatoes, here in Northern California they are just beginning to ripen. But it was worth the wait! Besides making salads, sauces, tomato sandwiches and canning for winter, I am always looking for something to do with these beautiful fresh tomatoes. This year I'm growing some rather large varieties that lend themselves to stuffing so today I'm going to fill some with a lovely combination of quinoa and fresh corn and bake them. Corn is at its peak of freshness right now too! Tomatoes are rich in the carotenoid, lycopene. The antioxidant nutrients in tomatoes are associated with heart health and cancer prevention. Preheat the oven to 350 degrees F. Lightly grease an 8 inch by 8 inch baking dish. Prepare the quinoa. Rinse the quinoa in a strainer under cold water for several minutes. Place in a small saucepan with water and bring to a boil. Reduce to simmer, cover and cook for 20 minutes or until all of the water is absorbed. Remove from heat and set aside. Slice the top off of each tomato. With a sharp knife, remove the pulp, dice it and set aside. Scoop out the rest of the pulp and seeds with a spoon. Set the hollow tomatoes in the baking dish. Cut at an angle and remove a large piece of pulp. Chop this pulp and set aside. It should yield about a cup. Scoop out the seeds and enlarge the cavity with a spoon. Place the hollow tomatoes in the prepared baking dish. Heat the Earth Balance in a frying pan. Add the onions, corn, salt and pepper. Cook for 5 minutes or until the onions soften. Add the tomato pulp and cook another 3 minutes. Stuff the tomatoes and bake for 20 minutes. Gently remove the stuffed tomatoes from the baking dish and serve. Cook the red onions and corn in Earth Balance. Stuff the tomatoes and bake at 350 degrees for 20 minutes. Per serving: 164.5 calories, 4.3 g fat, 0.9 g saturated fat, 0 mg cholesterol, 6 g protein, 27 g carbohydrates, 4.5 g dietary fiber and 330 mg sodium.